The Columbus Blue Jackets traded away a total of six draft picks – plus a conditional first-round pick – in the days leading up to the trade deadline to go all-in for their playoff run. With Thursday's loss to the Edmonton Oilers, the Blue Jackets fell out of a playoff spot and currently own the league's eighth-worst record since the deadline. 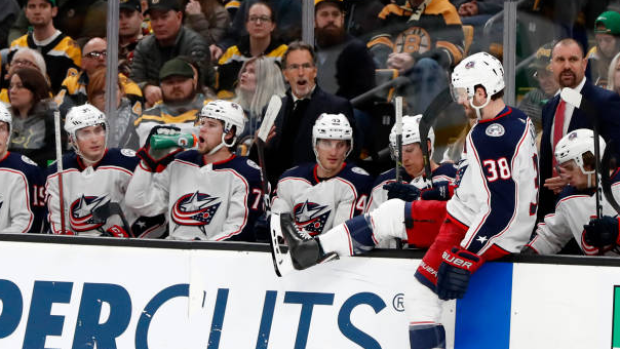 The Blue Jackets had managed to hold on to their playoff position for the majority of the past five weeks, largely thanks to the struggles of the Montreal Canadiens. The Canadiens, who bumped the Blue Jackets out of the final wild-card spot on Thursday, have the NHL's ninth-worst record since Feb. 25, when Montreal stood pat at the deadline. The Blue Jackets now sit one point back of the Canadiens with both teams having played 74 games. The Carolina Hurricanes have surged since the trade deadline and own a three-point lead on Columbus for the top wild-card spot, with a game in hand. The Blue Jackets traded a first-round pick along with prospects Vitaly Abramov and Jonathan Davidsson to acquire Matt Duchene from the Ottawa Senators ahead of the deadline. The Blue Jackets will also surrender their first-round pick in 2020 if Duchene re-signs in Columbus this summer. In 15 games since joining the team, the 28-year-old has three goals and six points – well off 1.16 points per game pace he had in 50 games with the Senators. Ryan Dzingel, acquired one day after Duchene from the Senators for two second-round picks and forward Anthony Duclair, has also struggled to produce since being moved. Dzingel, who had 22 goals and 44 points in 57 games with Ottawa, has just one goal with six assists in 13 games with Columbus. Finally, the Blue Jackets traded fourth- and seven-round picks and prospect Julius Bergman to the New York Rangers to acquire defenceman Adam McQuaid at the deadline. McQuaid is averaging less than 12 minutes of ice time since joining Columbus and has one goal with a minus-4 rating in 11 games. He was a healthy scratch for the team on March 3. Blue Jackets trade deadline additions - Struggling to Fit in? Duchene acknowledged after Thursday's loss that the pressure is on to produce or risk missing the playoffs for the eighth time in his 10-year career. "Now we are out of a spot and we have to chase it down now. We have some big games coming up and there is a lot of time left, but we need to make good on it," Duchene said. "It has to come ASAP. We don't have any time to mess around." While their deadline additions have struggled to produce as general manager Jarmo Kekalainen hoped they would, the Blue Jackets stars have also gone cold since the deadline. Columbus' top three scorers, Artemi Panarin, Cam Atkinson and Pierre-Luc Dubois, who form the team's top line, have produced just five goals and 15 points in 13 games since Feb. 25. Atkinson revealed Tuesday that the trio went out for dinner on Monday night in an attempt "to get on the same page" and added that a "higher-up" covered the bill. Panarin is the only player to post a point since, adding an assist in Tuesday's loss to the Flames. The Blue Jackets’ season has been clouded by the storylines of Panarin and goaltender Sergei Bobrovsky planning to hit unrestricted free agency in July. Bobrovsky had picked up his play slightly since the trade deadline before missing Thursday's game after head coach John Tortorella called him "nicked." The two-time Vezina Trophy winner had a 26-18-1 record ahead of the deadline with a .908 save percentage and 2.75 goals-against average. In 10 starts since, Bobrovsky has a 5-5 record with a .913 save percentage and a 2.57 GAA. It's unknown how much time the goaltender will miss. With eight games to go before the deadline, the clock is ticking for the Blue Jackets to find their way back into a playoff spot. Tortorella said Thursday having a sense of urgency is paramount for his team. Columbus will visit the Vancouver Canucks on Sunday in the final game of their Western Conference road trip. The team will meet the Canadiens in a crucial matchup on home ice next Thursday.